Anxiety is a tough battle especially when you have to face it day in and day out. There are many medical drugs that can be used to treat anxiety very well, however these treatments are addictive and how numerous side effects including drowsiness, headaches and even making symptoms of depression worse. It makes having a natural solution, which only benefit you and have zero negative side effects very important. Blue Ridge Hemp Co. have produced the CBD infused essential oil roll-on for just that. 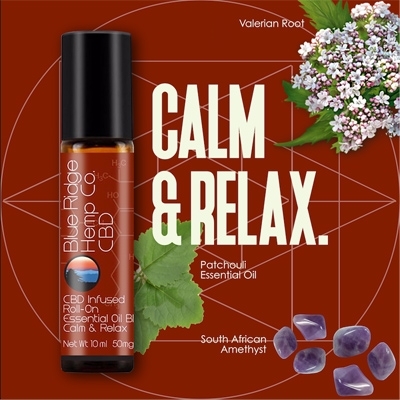 They have carefully selected and blended a range of all-natural ingredients that specifically address anxiety by calming tensions, promoting relaxation and promoting better and deeper sleep. Valerian Root Extract - is known and used to help with anxiety and insomnia. It has been found to promote the production of a chemical called gamma aminobutyric acid (GABA) in the brain. GABA helps to regulate nerve cells and calms anxiety. Many common prescription anxiety drugs also work by increasing GABA production but the benefit of using valerian root is that it doesn’t have the serious side effects of psychotropic drugs. Patchouli oil - is an incredible essential that has numerous uses including fighting infection, and reducing inflammation. It’s most common usage is to improve mood and reduce stress, patchouli oil increases the natural production of serotonin and dopamine, both are known to make you feel good and reduce the feeling of anxiousness. 99.7% Pure CBD Isolate – Has been to improve the symptoms of anxiety without any side effects. Extracted from Industrial Hemp and further refined with a clean energy processing technology to achieve pharmaceutical purity. The oil blend is quick and easy to use, it comes in a roll-on bottle which means you just rub a small amount onto either the temples or the back of the neck which allows the ingredients to quickly get to work. Patchouli oil is often used in fragrances and gives the oil blend a pleasant smell.